Whether you’re coming through to visit family, hunt and fish, explore history, or simply passing through and need a last minute hotel room, you have a few choices of where you’ll rest your head. No matter if you’re only staying for the night, or planning on an extended stay, our hotel in downtown Glasgow is ready to be your home away from home. From our recently renovated rooms to the building itself, we are committed to exceeding every one of your expectations and ensuring you have the best stay imaginable with us. 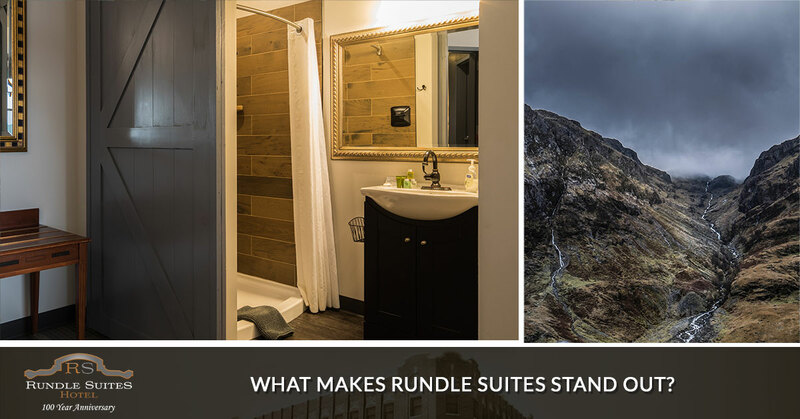 In this blog post, we’re going to give you just a few of the reasons why Rundle Suites is your obvious choice when staying in our quaint and historical town. When staying in Glasgow, you want to be able to explore. While other hotels are quite a bit away from downtown, we’re located right smack dab in the middle! This will give you the ability to walk around the streets that horses and carriages once rolled down, and puts you in walking distance from all of the restaurants and activities that our town has to offer. You won’t be sitting in the middle of nowhere twiddling your thumbs, but instead immersing yourself in the culture of Montana without losing sight of where you’re staying! The town of Glasgow has a rich history. From the American Indians that inhabited the area for hundreds of years and still celebrated today, to Lewis and Clark exploring just a stone’s throw away, our town will certainly impress any history buff that visits. Even more than that, our building itself has a fascinating backstory. 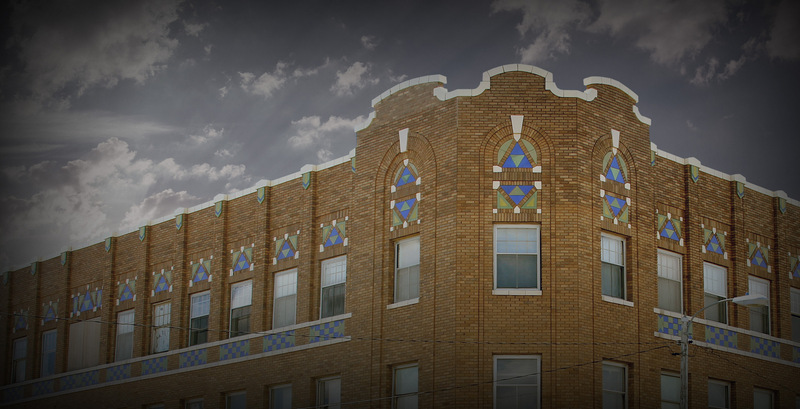 Built in 1915, the building was one of the first in the region to awe visitors and locals alike with their electric lights and elevator! Learn more about the history of our town and hotel in our previous blog post. 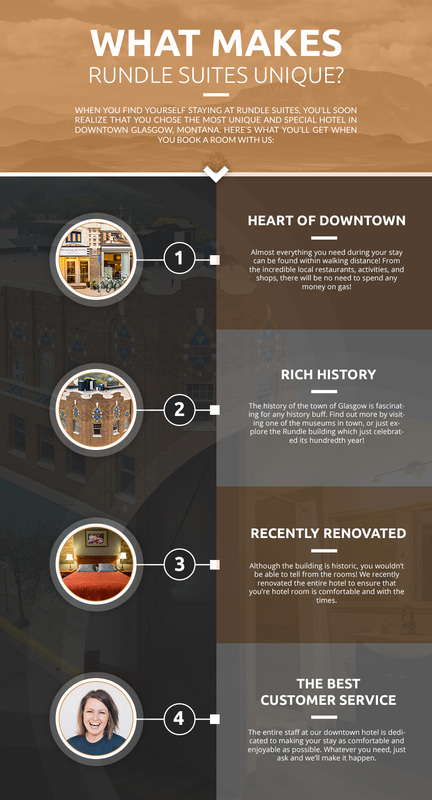 With the Rundle building recently having celebrated its centennial, we would like you to know that although we’ve kept its historical bones intact, we have recently remodeled and renovated our hotel. This means that the suite you’ll be staying in is clean, quiet, and extra comfortable. Be sure to view the rooms to see what we’re talking about! We pride ourselves on our customer service. If there’s even one guest that is unsatisfied, then we are not doing our job at the exceptional level that we are dedicated to. Your satisfaction is our number one priority, and we’ll make sure to accommodate you like you’re one of the family. If you need anything, just ask! No matter if you’re on an adventure or just a relaxing retreat, the Rundle Suites has everything you need to make your trip a great experience. You’ll never run out of things to do with our close vicinity to nearly everything you could ask for, as well as our hotel amenities including a pool table, lounge, cruiser bicycle access, and so much more! If you’re ready to find yourself off the beaten path, be sure to contact us today or book online now!